The classic trek to Dzongri peak (altitude of 13,123 feet) in West Sikkim, India, passes through magnificent rhododendron forests and culminates with the magnificent views of snow-clad peaks at Dzongri. The thrill of Dzongri, the meeting place of man and mountain gods, is an attention-grabber for sure. 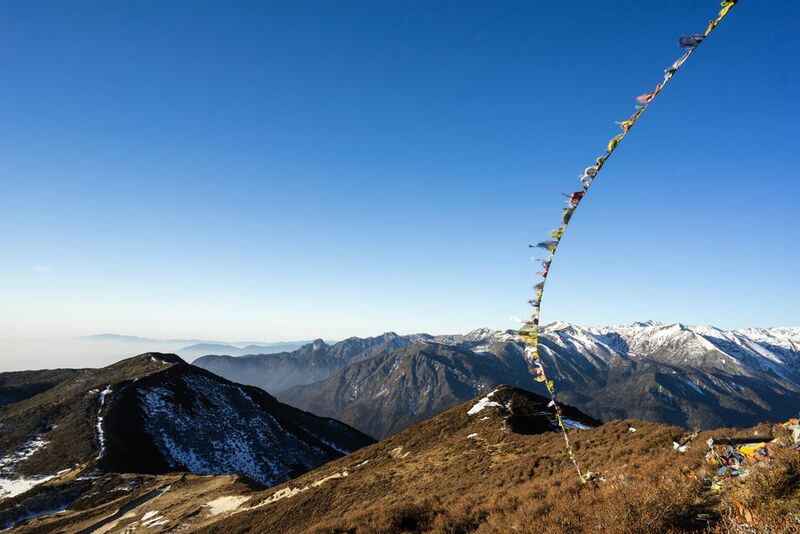 The best time to visit Dzongri is from mid-March through April, and then from September to mid-October, so you avoid snowfall and monsoon rains. However, owing to high altitude, there is a definite possibility of the climate taking unexpected turns during any time of the year. Start your journey from New Delhi. Take the Indian Railways 12424/New Delhi-Dibrugarh Town Rajdhani Express for a 21-hour trip to New Jalpaiguri. From New Jalpaiguri, the best option is to hire a taxi for the six-hour trip to Yuksom, the first capital of Sikkim and base camp for the Dzongri trek. Yuksom is a small village in Sikkim with a population of about 150, surrounded by mountains. The open roads and views of snow-clad peaks produce an immediate contrast with the otherwise crowded roads of Delhi. Hotels in Yuksom come cheap. Expect to share a bath. Get outfitted in Yuksom with a guide, cook, and porter and buy the supplies you'll need. The economy of Yuksom is mostly based on tourism, so the necessary logistics for the trek can be arranged locally. Alternatively, numerous travel agents in Gangtok can organize the Dzongri trek in advance. Everyone must register at the police station at Yuksom with a valid proof of identity. Separate trekking permits are also mandatory for foreigners. The trekking permits are available at tourism offices in Gangtok or Sikkim House in Chanakyapuri, New Delhi. The trek starts from Khangchendzonga National Park in Yuksom. The trek to Dzongri is ideally five days, with one day of acclimatization at Tshoka village. However, it's possible to complete it in four days if you want to skip the acclimatization day. Here's an overview of what to expect on each of the four trekking days. Day 1: Yuksom-Saachen-Bakkhim-Tshokha (11 miles) -- The trek to Tshokha passes through dense tropical forests of Khangchendzonga National Park, with magnificent views of mountains peaks and the mystical music of river flowing down in the valley. The first five or six miles of the trek are fairly easy, with picturesque waterfalls, a few hanging bridges, and magnificent red and white rhododendron flowers. The last few miles are particularly strenuous; the trek has a continuous ascent with a gradient of 45 to 60 degrees right up to Tshokha. This segment of the trek takes about eight hours. Day 2: Tshokha-Phetang-Dzongri (5 miles) -- This part of the trek can be challenging. You might start to experience symptoms of acute mountain sickness because of the altitude. A rest day at Tshokha might help with acclimatization, so consider this before deciding to skip it. The adventure in this segment is compounded by intermittent rains and frequent snowfalls. Although the trail is well-marked with wooden steps, snow can sometimes make it invisible, and you can get caught in a snowstorm on this route. Day 3: Dzongri-Dzongri Peak-Tshokha -- This is the goal of the trek, and you won't be disappointed if the day is clear. You'll get a spectacular view of the Kangchenjunga mountain range, the highest peak of the Himalayas in India, visible from Dzongri peak. Day 4: Tshokha-Yuksom -- Follow the same trail back from Tshokha to Yuksom. Money: Be sure to carry enough cash. Yuksom is a remote area and the ATMs are highly unreliable. Medical care: Acute mountain sickness is the main cause of concern on this trek. It leads to a loss of appetite, headaches and stomach upsets. It's advisable to carry adequate medicines because there are no medical facilities available during the trek. If the problem persists, you should move to a lower altitude. Oral rehydration salts help to avoid cramps that might result from excessive water and mineral loss through sweating. Clothing: The altitude of Dzongri makes it highly susceptible to unpredictable and inclement weather. Take good-quality trekking boots, sleeping bags, raincoat, and heavy woolen clothing. Food: You'll need to bring ample food supplies on the trek. It's advisable to carry carbohydrate-rich foods because the low concentration of oxygen at high altitudes slows down the digestion of fats. Ecological concerns: Polythene bags are banned in Sikkim. Cooperate with the authorities and dispose of all wastes in a proper place. Written with input from Saurabh Srivastava.